Cardinal Justin Rigali, who departed for Rome Feb. 26 to be present for the official retirement of Pope Benedict XVI and to participate in the conclave that will elect his successor, never expected he would have this duty. 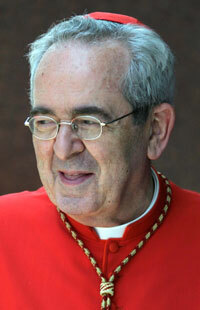 At age 77 and almost 78, he is eldest among the American cardinals eligible to be electors. “I wasn’t planning on it at all,” he said in a telephone interview from Knoxville, Tenn., where he is living in retirement. “It is a great honor and a great privilege and occasioned, as we know, by the pope’s action. But now it is time to elect his successor, and Cardinal Rigali has insights into the process because he was one of the electors at the 2005 conclave that elected Pope Benedict. “The gathering in the Sistine Chapel is itself a gathering to vote; the vote is preceded and ends with prayer,” he explained. In the meantime, outside of the formal sessions in the Sistine Chapel, the cardinals are together a good amount of time in informal sessions and have ample opportunity to exchange ideas either individually or in groups. It is prayer and reflection and further prayer. As Cardinal Rigali left for Rome, the date of the conclave had not yet been set, but whenever it begins it will most certainly last for more than one day. Calling attention to the popes of the more recent past in the 2,000-year history of the Church – Pope Benedict XVI, Pope John Paul II, Pope John Paul I, Pope Paul VI, Pope John XXIII and Pope Pius XII – Cardinal Rigali said, “We were blessed with people who were needed at that particular moment. When there was a need the Lord fulfilled it. It was the action of the Holy Spirit that inspired the cardinals in the long run to choose, so we have no question that the Lord will be with us.